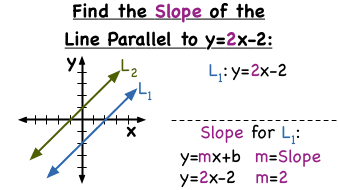 How Do You Find the Slope of a Line If You Have a Parallel Line? Looking at a graph of parallel lines? Got the equation of one of the lines? Want to find the slope of the other line? No problem! Just remember that parallel lines have the same slope! Use the given equation to find the slope of the first line and since the lines are parallel, that's the slope of the second line! To see an example, check out this tutorial. How Do You Know if Two Lines are Parallel? Parallel lines are lines that will go on and on forever without ever intersecting. This is because they have the same slope! If you have two linear equations that have the same slope but different y-intercepts, then those lines are parallel to one another! Perpendicular lines have slopes that are opposite reciprocals of each other. To find the slope of a line that is perpendicular to a given equation, find the opposite reciprocal of that slope. Check out this tutorial to learn how!